A while ago, a work colleague of mine went on a date with someone she’d met online. The next morning, we were all keen to hear how it went, but her expression as she walked into the office didn’t bode well. Online, the chap had claimed to be 5ft 10in tall. In reality, he was 5ft 5in, and spent all evening standing on tiptoes or perched on a kerb, trying to look taller. My colleague wasn’t interested in going on a second date with him. The problem wasn’t his height – she’s only 5ft 2in herself. It was the lie. (And, although she felt for the guy, his desperate insecurity wasn’t attractive either). Er, no. As believers, we’re called to hold ourselves to a higher standard of truth and integrity. ‘The Lord detests lying lips, but he delights in people who are trustworthy,’ says Proverbs 12 v 22. 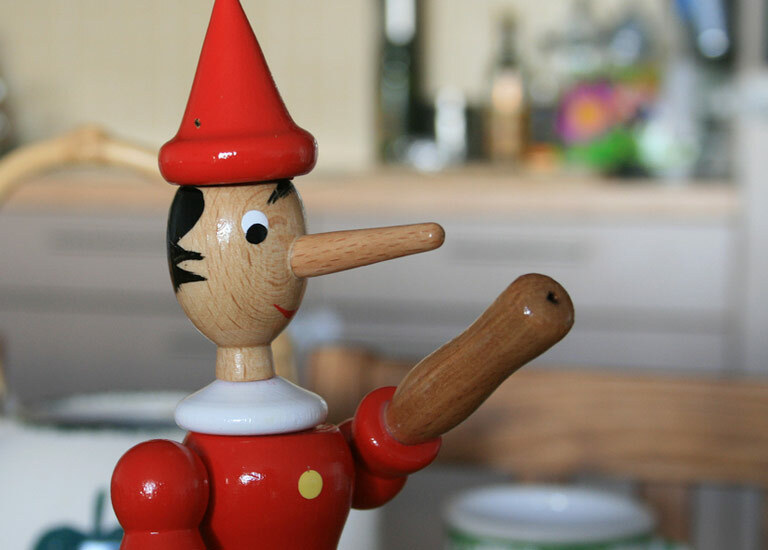 A lie is a lie, whether it’s knocking off a few pounds, adding a few inches, dropping a few years – or conveniently forgetting you’re married (as happened to one of my Facebook friends). Fibbing is also a serious own-goal in the search for love. Starting a relationship with a deceit, however small, is a red flag to any sensible person. Most of us are looking for someone who’ll always tell the truth, even when it’s difficult. How else can a relationship thrive? I believe that if someone will lie about the small things, they’ll lie about the big things. Even a ‘harmless’ fib would be enough to make me end a budding relationship – and I’m not alone. But don’t take my word for it – check out my Facebook page for some bonus stories and opinions from my Facebook followers. I’m not saying you have to spill every personal and embarrassing detail up front. If you don’t feel comfortable sharing certain information until you get to know someone, that’s your prerogative. In fact, it may be wise not to show all your cards at once. A health condition that inspires prejudice… the time you were jilted at the alter… a lifelong dedication to train-spotting?! You’re certainly not obligated to splash that all over your public profile, and you’re at liberty to decide when it’s the right time to share. But deliberate deceit? Not cool. In any case, lies always get found out, so why put yourself through the stress of wondering if you’ll get rumbled (spoiler: you will), or sweat over when to admit you were deceiving your date before you’d even met? One of the advantages of online dating is that you can be up front about those things that may put off some people, saving you from wasted time and disappointment down the line. I deliberately put things on my profile that I knew would put off certain types of people, so they’d weed themselves out and not contact me (it didn’t always work!). Being truthful isn’t just about words. The camera never lies, they say – but it does if you post a photo that’s several years, or several stone, out of date. Of course, we all want to show our best side and it’s natural to want to use our most flattering pictures on a dating profile. It’s also easy to convince ourselves that we look the same as we did five or ten years ago! Sometimes it’s hard to see ourselves as we really are. For instance (confession time): my weight fluctuates, but I’d naturally lean towards using a slimmer picture, because I prefer to think of myself as a slim person who’s currently carrying a few extra pounds, rather than a plump person who’s temporary lost some weight! However, if you turn up on a date looking radically different from your picture, you’re likely to be seen as a fraud (‘I thought she’d sent her mum!’ complained one friend after a disappointing date). Anyway, isn’t it better to come as a nice surprise than a horrible disappointment?! So friends, as followers of Jesus, let’s commit to total honesty in our profiles – yes, even if that means getting fewer dates. We honour God – and ourselves – by being truthful, and we’ll have the inner peace of starting any new relationship with honesty and openness, as we (hopefully) mean to go on. Have you ever been tempted to bend the truth a little in your profile? Or did you discover that a date had deceived you, and how did you react? We’d love to hear your stories! Photo by Jean-Etienne Minh-Duy Poirrier. Licensed under Creative Commons. Would Like To Meet by HopefulGirl is packed with funny and moving stories from the Christian dating scene. To buy the book (in paperback or Kindle) or download a free sampler, visit www.brfonline.org.uk/hopefulgirl. You can connect with HopefulGirl at www.facebook.com/HopefulGirlUK or www.twitter.com/HopefulGirlUK. HopefulGirl is the singles/dating columnist for Woman Alive magazine.